Youthfront Missional Journeys are about shaping the desire of youth for a more just and reconciled world through intercultural, Christian formation experiences. We don’t have to teach youth about an unequal world. They already know it. Every day our young people walk into school lunchrooms and sit down with certain groups of friends at certain tables because they abide by a set of unspoken rules. Some are rewarded. Some are not. Where they rank is largely sorted out for them. They already know privilege. They feel the threat of marginalization every day. They long for a different, reconciled, liberated lunchroom. Youthfront Missional Journeys begin with the longing for a more free, more just world that is already inside of youth. But it’s a longing that is unnamed and underdeveloped. Through intentional, spiritual formation times, we help youth connect the dots and see their city and their world as that same divided, broken lunchroom to which Jesus longs to bring healing and reconciliation. Youthfront Missional Journeys push youth to think beyond themselves, shaping their desire for reconciliation to include a broadening circle of people who face even greater depths of alienation. “Serving others is good. It’s a start. But it’s just the hallway that leads to the Grand Ballroom of kinship with others.” – Fr. Greg Boyle, Homeboy Industries. 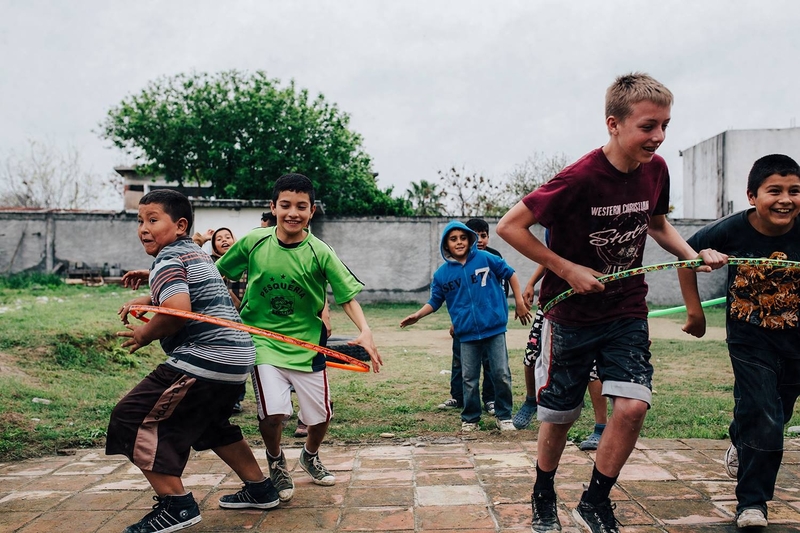 During Youthfront Missional Journeys, youth will engage in tangible expressions of Christ’s love like painting a neighbor’s house in Kansas City or building a school in Mexico not only because it blesses others but because developmentally, youth connect with concrete, immediate action. But what we’re more interested in is something that goes both ways. When service is only one way and can’t be reciprocated, its really hard to be friends and truly view the other as equal. We all need one another even if we don’t realize it yet. To move from service towards kinship, we have to put the tools and paintbrushes aside. When we share a Coke or are invited to eat someone’s home-cooked bbq and we relax and listen to one another, something happens. People who were once strangers, maybe even people who might have been afraid of each other before, suddenly don’t seem so scary. They become human. And when we work alongside the youth of Argentine or masons in Mexico, we take a step to take the spotlight off of ourselves and make locals the heroes in their own community. On Youthfront Missional Journeys, we try to foster these moments and postures towards others that open the door to friendship. Becoming friends in a broken, aching, and angry world demands more than well-intentioned groups of young people who will bandage the bleeding for a week. What is woefully absent in most mission trips and service projects is a deep understanding of the invisible social dynamics and histories that cause the bleeding. If we fail to think critically, if we accept easy answers and only see what is on the surface, we minimize, flatten, and dismiss the complexity of the pain others experience. We believe our most important work on Youthfront Missional Journeys is to help youth to think critically, to become students of the unseen. Through pre-trip training exercises and enlightening, on-site discussions with local experts, we help uncover the things that separate us. We see history in the present. We learn it’s not just someone else’s problem but ours. Only then can we all be healed by Christ’s action. This work of diligent learning and humble listening takes priority over any of the hands-on labor that we provide. On Youthfront Missional Journeys, we attempt to align hands-on work activities with long-term efforts of Christian community development in Croc, Mexico and the Argentine neighborhood of Kansas City, Kansas so that we participate in real, lasting good. Croc used to be a rural community that was distant both culturally and geographically from the city of Monterrey, Mexico which now feels the city and its fast-growing industry nipping at its toes. It’s amazing to see how this town and how Youthfront’s ministry have changed over the past 14 years, becoming much more complex and sophisticated as locals have taken leadership. Our after-school program provides kids in Croc with fun activities and additional classroom time where they can wonder at God’s world and know their place within God’s mission. On a Youthfront Missional Journey in Croc, your hands-on work will be helping to host an exciting summer camp for local kids, preparing fun games, workshops, and lessons. Additionally, you’ll work alongside locals to transform our afterschool program facilities into an all-day school. Not only will this help give kids a more quality education in subjects like math and Spanish, but they’ll also better understand themselves, one another, and the world in which God has placed them. *Cost includes all food, lodging, program and construction expenses, local labor, translators and other costs your group will incur during their Missional Journey (except for transportation, passport/visa, and personal expenditures). * Other Summer dates may be available upon request. *** Dates also available during spring/fall breaks and throughout the year. We’d love to serve you and are flexible on dates and shortening a stay for a retreat/intensive. Missional Journeys are led and facilitated by Youthfront staff members who live and work in their respective communities full-time. College-aged summer staff provides additional support. Argentine is an ethnically-diverse neighborhood that is mostly Hispanic. It’s a working-class kind of neighborhood with many young families and immigrants from Mexico. Argentine has a lot going for it with new efforts at revitalization that are helping to change it for the better, but like many under-resourced, urban neighborhoods, it has familiar problems of racial divisions and blight. Hands-on work during a Youthfront Missional Journey in Argentine will include painting, clean up and minor home repair. Last year, some of our neighborhood partners helped provide financing for immigrant neighbors so that they could become homeowners. 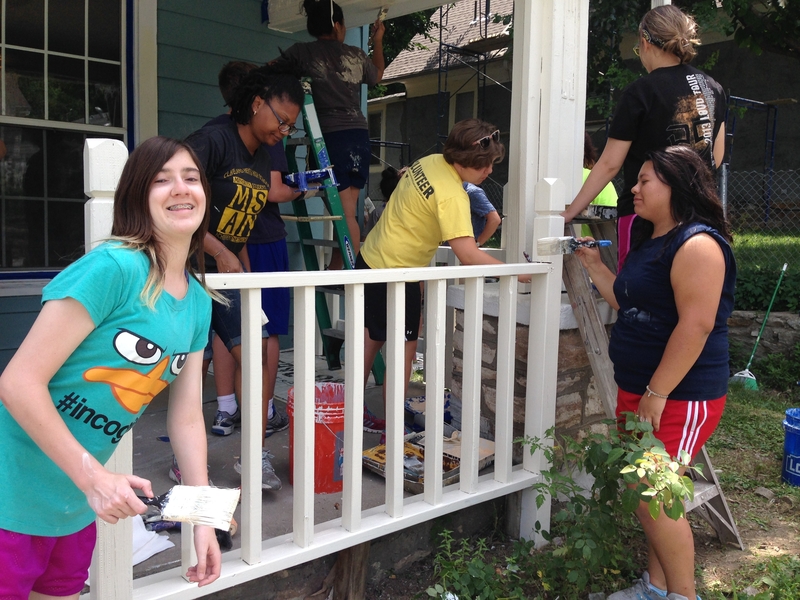 We helped paint those houses and were part of a story of bringing beauty and stability to our neighborhood.